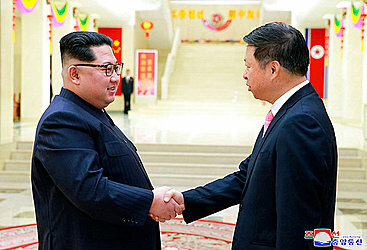 PYONGYANG, North Korea (AP) — North Korean leader Kim Jong Un has met with a high-ranking Chinese diplomat in Pyongyang, amid a flurry of diplomacy following Kim's recent surprise visit to Beijing. Song Tao, who heads the ruling Communist Party's International Department, led an art troupe to Pyongyang to attend an arts festival, according to China's Foreign Ministry. Kim's trip, during which he met with Chinese President Xi Jinping, was considered an attempt to repair traditionally warm ties with China that have deteriorated over North Korea's development of ballistic missile and nuclear weapons technology and China's enforcement of United Nations economic sanctions. Kim said during his meeting with Song on Saturday that he and Xi "reached important consensus" in Beijing, according to China's official Xinhua News Agency. Song agreed that the two leaders had reached consensus, and said China is willing to work with North Korea to safeguard peace on the Korean Peninsula, Xinhua reported. Kim is scheduled to meet with Moon on April 27 in the Demilitarized Zone that divides the Koreas. He is expected to meet with Trump in May or June.